Prusa i3 MK2/S/3 Filament Guide ClipOn by Area51 is licensed under the Creative Commons - Attribution - Share Alike license. 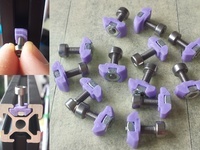 The Prusa i3 MK2/S/3 kit comes without a filament guide - this is a problem when using stiffer filaments on small spools. The filament tend to unwind and get stuck when printing. 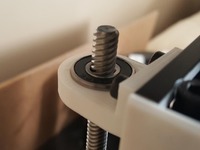 My filament guide is a two part solution, a base with a new ClipOn design to lock the guide to the Prusa frame and an interchangeable filament guide (loop). The ClipOn Holder (base) it is securely locked to the aluminum frame, but still easy to re-position. 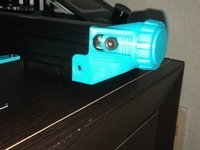 The loop has a friction fit into the holder that closes the filament loading slot and prevents the filament from escaping the loop when printing. Select a ClipOn Holder rectangular or angled. Angled version will prevent collisions in top Z positions. Select a Loop size and if it should have filament slot. If you often forget to put the filament through the guiding loop when loading the hot end, the guide with filament slot is the solution. 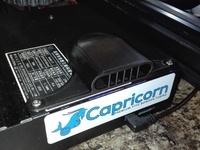 The thin part of the ClipOn base acts as a spring but is strong enough the securely hold the top part in place. I tested with PLA and PETG and both materials works great. Let me know in the comments if you have ideas or changes to the design. Print with PLA, ABS, PET-G or similar. 2 perimeters, 3 top and 2 bottom layers 50% infill. The loop should fit into the base, but you may need to smooth the loop guide surface with a knife or sand paper to get an easy friction fit into the base.